Mortar is a workable paste used to bind building blocks such as stones, bricks, and concrete masonry units, fill and seal the irregular gaps between them, and sometimes add decorative colors or patterns in masonry walls. 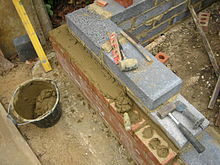 In its broadest sense mortar includes pitch, asphalt, and soft mud or clay, such as used between mud bricks. 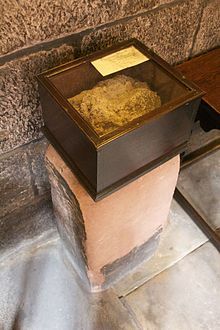 Mortar comes from Latin mortarium meaning crushed. ^ "Revealing the Ancient Chinese Secret of Sticky Rice Mortar". Science Daily. Retrieved 23 June 2010. ^ "Information about Lime - LimeWorks.us". limeworks.us. Retrieved 2016-11-02. ^ Folk RL, Valastro S. (1979). Dating of lime mortar by 14C (Berger R, Suess H. ed.). Proceedings of the Ninth International Conference: Berkeley: University of California Press. pp. 721–730.